Though I was raised in a large town, I’ve become much more of a country boy. As well as a healthy dislike both of concrete and crowds, I don’t particularly enjoy art or museums, though I will make a brief exception for the Natural History Museum – brief in that I can’t spend too long there. And [that initial conjunction was just for dramatic effect] I most certainly don’t like shopping. It is hardly surprising, therefore, that I’m not a fan of cities. In truth, cities have little that interests me. The exception is that they do tend to have a decent supply of eclectic foodstuffs, which I do appreciate. That’s a lot of downsides for one benefit, though. Nonetheless, we began the month of February by muttering “white rabbits” and arranging a train trip into London. The main reasons for our trip were twofold. First, the National Theatre is hosting an exhibition of LPOTY (Landscape Photographer Of The Year) 2013, otherwise know as Take a View, which Carol was keen to see. I was quite keen to see it, too, but see above. Carol’s second target was the National Gallery which has borrowed from Amsterdam a partner to its own Van Gogh sunflowers painting. Like it or not, I was off to a pair of Nationals. We’d lashed out on day travel cards that included underground travel, just in case, but fortunately the sky remained mostly bright and we walked down from Euston to Waterloo Bridge, crossed the Thames and found the National Theatre. London seemed relatively quiet, though it was still reasonably early at about 10:30 AM. Less obvious was the location of the entrance to the National Theatre but we figured it out eventually and spent a happy hour or so staring at mostly very impressive landscape shots by those who know what they’re doing with full frame DSLRs, together with a few medium format cameras still using good old Fuji Velvia film, frequently with the de rigueur Lee Big Stopper (a 10-stop Neutral Density filter) to slow things down a lot. Whereas we nature photographers want ever faster ISO speeds with reduced noise, the landscape brigade wants lower ISO speeds to get that milky, blurred water effect, though that’s becoming almost like an over-used special effect these days, IMHO. Enjoyable stuff, though, and a worthy winner. 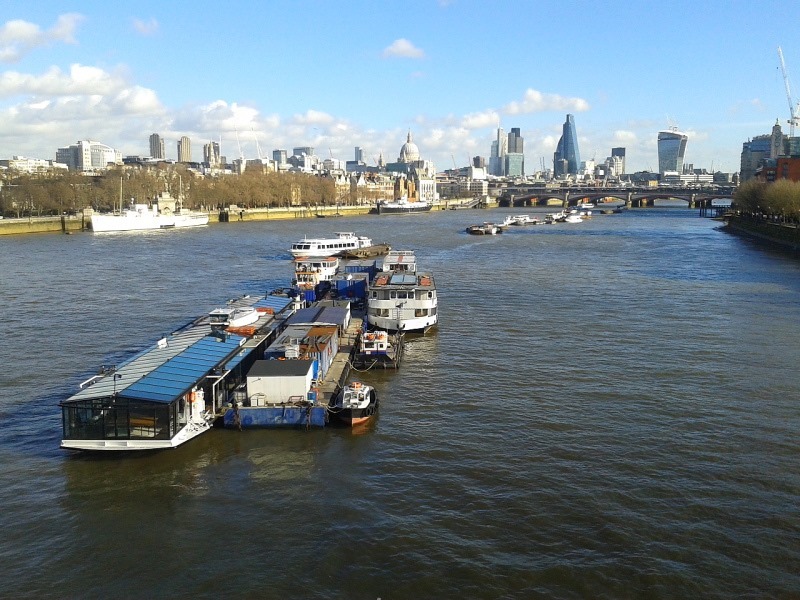 We made our way back across the Thames and headed for Covent Garden in search of lunch. Failed. After fighting our way past several Chinese lion dance troops celebrating their new year, we finished up at Leicester Square where a burrito at Chiquitos vaguely appealed, largely because I hadn’t seen a Mexican restaurant of any description since working in the States. All I really wanted was a simple sandwich but I suppose a burrito is like a Mexican sandwich. It’s the accompanying drinks that hit the bank balance, especially when Carol wants a margarita and you need a second round ‘cos the food takes a while to arrive. Nonetheless, quite enjoyable despite being a bit of rugrat magnet. Time for our second National of the day, the National Gallery; we headed for Trafalgar Square. Now, this really was just for Carol. Art really isn’t my scene but if I’m going to look at a paining, I like it to be recognizable. Fortunately for me, then, one of the first galleries we encountered contained some Canalettos. Now here’s an artist. Here is someone who can put paint on canvas and end up with a very lifelike representation of Venice, so lifelike that you feel you could reach out and touch it, lift the figures from the gondolas kicking and screaming – very King Kong! I was once told by a fine art student that such realism is easy but I never did believe him. It certainly beats Picasso’s idea of what a woman’s face looks like. We soon found a short queue to get into Van Gogh’s pair of sunflower canvasses, only to discover that there was another queue of 30-45 minutes to get a ticket that enabled one to join this second queue. Not being that interested in queuing, I left Carol waiting and went outside in search of something to kill time. Outside in Trafalgar Square I found a pair of extraordinarily blue things. One was an almost clear blue sky, the like of which we’ve hardly seen this winter. The second was a giant blue cockerel atop a plinth. Both these blue things are as rare as hens’ teeth. 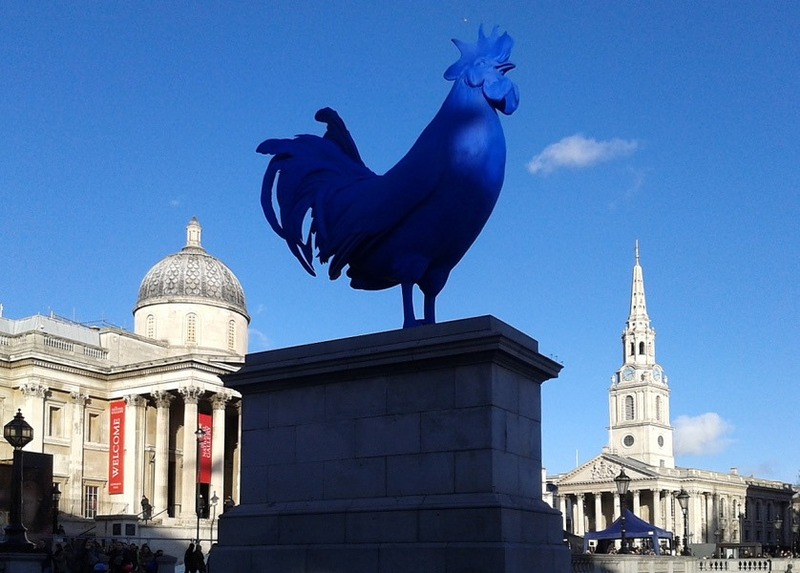 Now what, pray tell, is an enormous blue cockerel doing in Trafalgar Square? 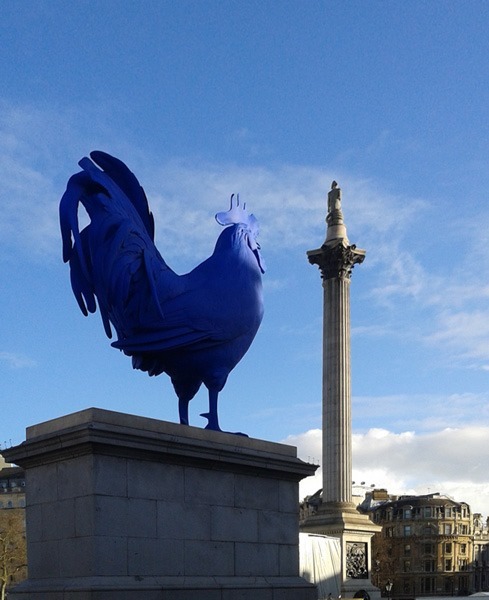 Who thought a big blue chicken would enhance the ambience of an otherwise historic London landmark? What’s wrong with traditional grey stone lions? Just look at the juxtaposition of this against Admiral Lord Nelson atop his impressive column. The poor hero of Trafalgar will be turning in his grave. Carol emerged from Van Gogh’s twin-pack of sunflowers after about an hour. It seems that Van Gogh painted this same vase of sunflowers four times. Now that’s what I call milking it. It’s a bit like Hollywood not knowing how to make an original film and going for a remake instead. We never did use the underground. The walk was enjoyable, though, after being trapped by weather for so long.